LEWIS HAMILTON has revealed he clinched his fifth world championship just days after the death of his grandfather, Davidson Hamilton on Thursday morning before the Mexican Grand Prix. Like the true professional that he is, he went out and put in a great performance. He said. "Naturally when someone passes away it brings the whole family together but he was the godfather of the family." So how did he keep it all together and compose himself to get out onto the track on Sunday? I love this quote "success leaves clues, and that people who produce outstanding results do specific things to create those results." - Tony Robbins. 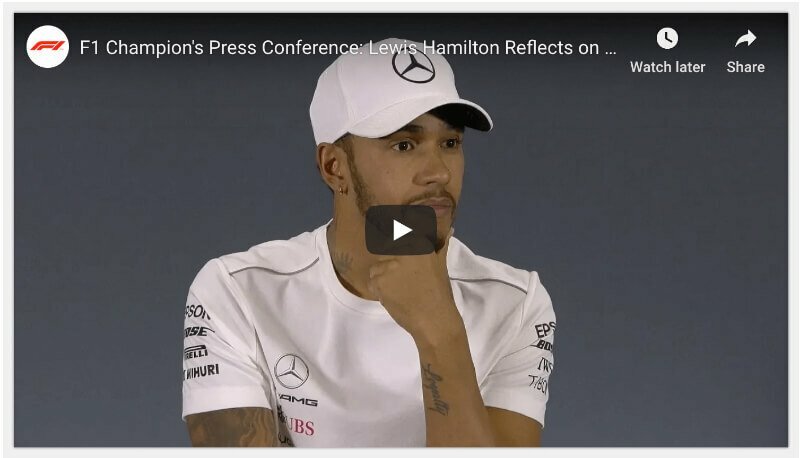 As I listened to Lewis reflect on his victory, after he joined Michael Schumacher and Juan Manuel Fangio as the only drivers to win 5+ world titles, I discovered the 12 success and resilience clues Lewis shared at the 2018 F1 Champion's Press Conference. Train yourself to prepare mentally. Work hard to ensure you have the right energy and balance in life. Work hard and ask yourself... how are I raise the bar, how can I squeeze some more out of myself. Stay positive, humble, happy and content "We still finished 4th, which is what we needed". Describe every event in life from a positive mindset. Describe your current situation as it is not worse than it is. Time is so precious, cherish moments of success, absorb it before moving on to the next thing. Set your sights on future goals. "I still have so many target so many things that are ahead". Do everything to achieve your goal. Winning the title is the number one goal on Lewis's todo list. "I do everything for that". Let your work speak for itself. Lewis's father told him "do your talking on the track.... ". Let what you do contribute to people's opinion of you, not what you say. Be proud of what you've accomplished and how far you've come. Love what you do. Do what you love Lewis said..."I LOVE driving"
Every year he enjoy more. Worry about things less. Focus more and let things go quicker. Move forward and grow faster. See the sparkle in others coming up behind you and Inspire their success. Remember the legacy of those who worked hard and sacrificed so much so that you could be where you are today. Speaking of Davidson Hamilton, his grandfather, Lewis said "I really do aspire to be like him, as a man, as a strong black man, as a father and as a human being, doing what he did with the difficult times and the little he had. That is testament to where we are." In Aug 2016 Lewis Hamilton shared these words about his late Grandfather, Davidson Hamilton. "A truly special day spending time with my Grandad in Grenada yesterday. Can't tell you how much it meant to be able to sit with him. God bless you, Grandad, and thank you all you've done for our family." Lewis Hamilton drew strength from the passing of his grandfather knowing that he we not just racing for himself but for his father and grandfather who paved the way for him to be a five time Formula 1 world champion. YES, then join our 6,000 + Community and receive exclusive support. We share techniques to help improve relationships, lower stress and build resilience for business performance and life success. Co-founder of InspiredResilience, IT Project Manager, husband, father and community leader, supporting, encouraging and inspiring others to excel in business and life.